JMA reported that activity at Ontakesan continued to decline during 26 June-3 July, although the volcano continued to be seismically active and emit white plumes to less than 1 km high. The Alert Level was lowered to 2 (on a scale of 1-5). This Bulletin report on Ontakesan (Kiso-Ontakesan, Ontake) covers activity from November 2003 to November 2014. During this reporting interval, two eruptions occurred, both broadly described as phreatic, yet containing a minor component of identified juvenile magmatic material. The first eruption was on an unknown date in late March 2007, and the second eruption was on 27 September 2014. The 2014 eruption took place with a sudden onset and with few if any precursory warnings. The volcano is a famous tourist area to see color changes in autumn foliage, it also contains considerable alpine touristic infrastructure, including lodges. The 2014 eruption took place during the autumn color season on a Saturday. Hundreds of people were on the mountain at the time. The 2014 eruption included ashfall, pyroclastic flows, and related density currents. The eruption killed ~57 people and an additional 6 were still missing as of 27 October 2014 (Kyodo, 2014). The 2014 impulsive eruption was documented by an outstanding number of close-up photographs and videos taken by eyewitnesses. Between the 2007 and 2014 eruptions, activity receded to background levels. Our last Bulletin report (BGVN 28:11) noted occasional white plumes during 2000 to 2003. The data for this report was collected chiefly from online reports by the Japanese Meteorological Agency (JMA), the Geological Survey of Japan (GSJ), and the National Institute of Advanced Industrial Science and Technology (AIST). Historically, activity at Ontakesan has consisted mainly of phreatic explosions every several hundred years. However, recent research cited in JMA (date unknown) indicates that over the past 10,000 years, four magmatic eruptions have also occurred. 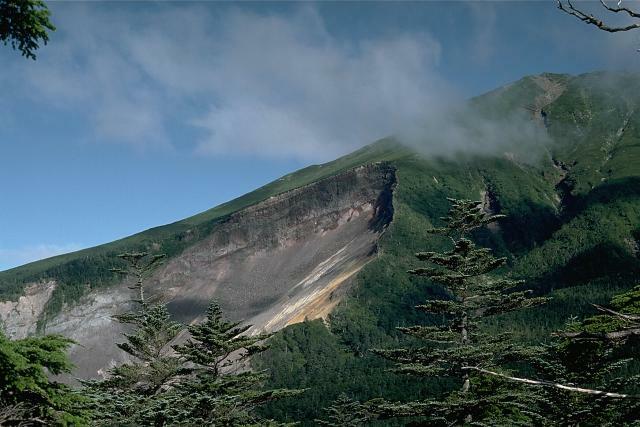 Although there are no reported records of historical eruptions before 1979, fumarolic activity was noted as ongoing for several hundred years near to Ontakesan's summit (Jigokudani and Hachotarumi). The period of activity after 1979 represents what appears to be Ontakesan's most active during the past 250 years (Oikawa, 2008). 2006–2007. The March 2007 eruption was preceded by minor inflation and an increase in seismic activity (JMA, date unknown). During mid- to late December 2006, instruments detected inflation of the volcanic edifice and an increase in shallow seismicity directly below the summit. During January 2007, instruments recorded 90 earthquakes on the 16th and 164 earthquakes on the 17th. On 25 January 2007, tremor occurred with the largest recorded amplitude in at least a year. Tremor had, according to a JMA plot, remained near zero during all of 2006. The January 2007 tremor was described as very low frequency, containing a 15- to 20-second-long component. Furthermore, GPS observations detected a small amount of crustal deformation preceding the seismic activity, indicating a slight inflation at Ontakesan. On 16 March 2007, fumarolic activity increased; fumes at the summit were occasionally detected by a surveillance camera (at "Mitake Kurozawa," but the exact location was not found in English on maps in Ontakesan reports). Seismic and other data considered by JMA showed that an earthquake had occurred during late March, originating directly below Ontakesan. The specific dates of the seismicity and earthquake were not specified in the available reporting. Based on the data collected, JMA inferred that the earthquake had resulted from a magmatic intrusion that had advanced toward the surface reaching ~4 km below the volcano's summit. A field study two months later, on 29 May 2007, noted fresh volcanic ash from Ontakesan's 79-7 crater. The ash reached ~200 m NE of the crater. This finding of fresh ash was believed to indicate that the 2007 eruption was not merely phreatic but involved some escape of juvenile components to the surface. The exact date of the eruption was undeterminable. JMA cited a model by Nakamichi and others (2009) regarding the intrusion of a magmatic body and the subsequent 2007 eruption, to describe phreatic eruptions at Ontakesan (figure 12). The depths shown reflect but one set of depth values for the top of the intrusion ((a) in this case 3 km depth below the summit) and the zone of groundwater ((b) centered at ~2.4 km depth below the summit). Thus, figure 12 illustrates a basic model of the various processes involved in a phreatic eruption, which is defined by Harris (2000) as a ". . . steam eruption that produces no fresh magma. A common precursor of eruptive activity, it is caused when groundwater, heated by a magmatic source, flashes into steam." Figure 12. Diagrams (a and b) that JMA cited to help explain magma intrusion, steam generation, and related signals associated with a phreatic eruption. Courtesy of JMA, citing Nakamichi and others (2009). Figure 12a considers an earlier pre-eruptive stage, where magma advanced upward to 3 km below the volcano's summit. Volcano-tectonic (VT) earthquakes resulted from breaking rock. Note that in the March 2007 eruption, the magma was thought to have advanced to 4 km depth below the summit and the tremor noted then was very-long period (VLP, because of the above-mentioned long-period (15-20 second) component). Figure 12b considers a later stage of the intrusion event, where the magma ceased to advance towards the surface. The magma heated the groundwater, which expanded into steam. The pressure from the heated water and steam broke rock as it advanced towards the surface. Acoustical signals include VLP and long period (LP) earthquakes. In this model, the steam escaped through the ancestral vents, thus producing a phreatic eruption. Eruption in September 2014. Available JMA and GSJ reports say very little about the period leading up to the September 2014 eruption. According to a news source (Asahi Shimbun, 2014b), during the early part of September, daily tremor peaked at 85 on 11 September and were followed by 3 to 27 tremor events per day starting on 12 September. The JMA Executive Committee (2014) reported that on the morning of 27 September, a few hours before the eruption at 1152 Local Time (LT=UTC+9), there was no major unrest. They did record mild seismic events, tilt, and increased steaming; the noted data appearing from 1130 to 1210. The report noted that seismic signal recorded 11 minutes prior to the eruption was nearly flat, with only one small event, in contrast to the robust signal associated with the subsequent eruption. Tilt began 7 minutes prior to and peaked during the explosion. GSJ (2014) stated: "A volcanic eruption occurred on September 27, 2014 at Mount Ontake on the border between Nagano and Gifu Prefectures. According to the Japan Meteorological Agency, the eruption began at about 11:52 JST [Japan Standard Time] (=UTC+9h) on September 27. It is estimated that the plume from this eruption reached a maximum height of 7000 m, and a pyroclastic flow cascaded down the mountain in a southwesterly direction for a distance of more than 3 km." Additionally, about forty minutes later, the Tokyo Volcanic Ash Advisory Center (VAAC) noted that the plume resulting from the eruption ascended to 11 km above sea level (a.s.l.) extending to the E. The JMA raised the Alert Level to 3, and the level remained elevated throughout the reporting interval. Figure 13 provides an oblique view of the volcano with the approximate area of the eruption and the summit mountain lodge labelled. Figure 13. A DigitalGlobe Google image of Ontakesan with a label indicating the approximate area where the sudden eruption vented (on the S flank). For scale, the prominent crater atop this part of the cone is ~200 m in diameter. Several bodies were found within the mountain lodge and other infrastructure on and near the summit rim. Courtesy of BBC (2014b). The 27 September eruption was captured by a camera system (Yamamoto, 2014; AIST, 2014b; GSJ, 2014) (figure 14). The term pyroclastic flow generally applies to laterally moving mixtures of hot gas and particles such as tephra and lithics; a broader term that includes ash cloud surges, etc. is pyroclastic density current (see Roche, 2015, and the references therein). In the case of the 2014 eruption, density currents occurred near the summit and on the western flank; some of the complexity may have been due to secondary explosions well downslope of the vent area (AIST, 2014b; Boyle and others, 2014). The density currents descended at variously reported maximum speeds of 30 to 72 km per hour (AIST, 2014b; Yamamoto, 2014). According to Boyle and others (2014), the pyroclastic density currents traveled more than 3 km down Ontakesan's S flank. Figure 14. Four photos of the Ontakesan 2014 eruption captured by the Chubu Regional Development Bureau's camera at Takigoshi on 27 September. (1154 LT) The pyroclastic flow descended. (1156 LT) A secondary plume rose. (1201 LT) The plume released a downburst of ash. (1205 LT) The plume developed laterally, spreading along the ground surface. Taken from Yamamoto (2014). On 28 September, the day following the eruption, the GSJ conducted several aerial observations, utilizing media helicopters (GSJ, 2014). At 0800 LT, the height of the plume was ~500 m, heading S to SW. The scientists noted the eruption formed a new line of craters (figure 15) running NW to SE. These new craters resided 250–300 m to the SE of those formed during a previous eruption in 1979. The line of craters is roughly parallel to the 1979 line, but covers a wider area. Figure 15 Aerial view of Ontakesan from 28 September at 1636 LT. The Kengamine summit area, as depicted from the NW, released white plumes heading S to SE. The smaller plume in the foreground originated from a fissure crater on the W end of the new line of craters. The distant plume originated from the line of craters formed at Jigokudani, located SW of the summit . Additional photos of the eruption, similar to this one, are provided by the authors. Source: GSJ (2014). GSJ also conducted expeditions to the Kaida Plateau, located ~6 km E to NE of the Kengamine summit, and collected ash samples on 28 September. A photo depicted in GSJ (2014) shows a light coating (on the order of several millimeters) of gray ash covering the leaves and horizontal surfaces of plants in the region. The geologists described the ash as "medium-to-fine-grain sand-sized particles" with a maximum diameter of 0.5 mm. Most of the ash was altered rock fragments and less than 10% was unaltered red-orange and crystalline fragments (as seen in figure 16). GSJ (2014) reported that, as a result of this ash analysis, the recent eruption was considered as phreatic (rather than predominantly magmatic). Figure 16. Samples collected at Ontakesan. (Top) A majority of this ash sample was altered. (Bottom) A sample with some fragments of unaltered ash. The AIST report also includes a detailed description of the methods used to gather/ analyze ash samples. Courtesy of AIST (2014a). GSJ (2014) also noted that scientists had charted the main axis of ash fall from the 2014 eruption, based on the findings from their expeditions. The ash distribution extended towards Ontakesan's E to NE (red arrow, figure 17). Figure 17. Geological map of Ontakesan containing annotations relevant to the 2014 eruption. The main axis of ash distribution is noted by the red arrow. The line of craters formed by the 2014 eruption are marked approximately by a series of small red dots and a yellow line near the base of the red arrow. The 1979 line of craters is depicted as a row of green dots. The blue line denotes the known margin of the Younger Ontake Volcano formed ~100,000 years ago. Source: GSJ (2014). News sources contributed the following. The ash resulting from the eruption was ~50 cm thick near the crater and up to 20 cm thick in lower areas (Adonai, 2014). Asahi Shimbun (2014b) also quoted a scholar, Takayuki Kaneko, as allegedly stating that the ash was "moist" and stuck together like "sesame seeds." According to JMA, from 1 to 7 October, Ontakesan continued to emit ash, but the resultant plume height could not be determined due to poor visibility. On 7 October, the plume was observed to rise 300 m above the crater rim, drifting E. Tremor continued to be detected; the number of earthquakes detected from 27 September to 6 October are compiled in figure 18 (JMA daily reports). Figure 18. The number of earthquakes detected per day during 27 September to 6 October 2014. Data courtesy of JMA (daily reports); figure by Bulletin editors. According to JMA, Ontakesan emitted ash plumes during 8–9 October, white plumes on 10 October, and plumes with only small amounts of ash during 10–14 October. During 8–14 October, tremors were below the detection limits. White plumes rose 100–200 m above the crater rim, drifting NE and SE, during 16–18 October. On 19 October, plumes rose to 600 m above crater. Impact of eruption on people. As previously mentioned, according to news sources, the 27 September eruption killed 57 hikers on Ontakesan's slopes, and as of 27 October another 6 were missing (Kyodo, 2014). Furthermore, more than 70 were injured (RT, 2014). According to the Associated Press in Tokyo (2014), the explosion was the deadliest volcanic eruption in Japan in the post-WWII period. According to the BBC (2014a), nearly 300 people were hiking on Ontakesan on the day of the eruption. The news article characterized the accounts of the eruption as consisting of falling ash and boulders, at times with sufficient density to cause several minutes of total darkness. Kuroda Terutoshi (Kuroda Terutoshi, 2014), posted a video of the eruption to YouTube that he took while hiking. The expanding ash plume engulfed a cabin on the slopes above him, and he was soon surrounded by the plume, which included dark ballistics and ashfall. The ash plume grew rapidly and continued downhill, as depicted in two other videos (Asahi Shimbun, 2014a and BBC News, 2014). Boston Globe (2014) stated that rescue and recovery missions began on 28 September deploying more than 500 Japanese military and police. Metal and landmine detectors played a role in locating victims buried under ash (Asahi Shimbun, 2014c). National Geographic (2014) and Ogrodnik (2014) provide several photos of the rescue missions, derived from various news sources. According to Malm (2014), several of the casualties found during rescue operations were "still holding their smartphones." Lies and Meyers (2014) noted the halting of some initial search and recovery efforts on 30 September owing to increased tremor the night before raising concerns then about the return of volcanic activity. On 6 October, Typhoon Phanfone (No. 18) came near to the Ngano Prefecture where Ontakesan is located (Asahi Shimbun, 2014b, c). Accompanied by heavy rains, a mixture of volcanic ash and rain formed into mud, making it hard for large helicopters to land near the summit. Rescue missions were halted on 15 October due to the wintery conditions despite people still missing. The article said that the search for bodies was expected to resume in the springtime. Harris, 2002, Archaeology and volcanism, in The encyclopedia of volcanoes. Sigurdsson, H., Houghton, B., McNutt, S., Rymer, H., and Stix, J. (Eds.). pp. 1301-1314. Elsevier. JMA reported that cloud cover mostly prevented visual observations of Ontakesan during 13-20 February; white plumes rose 50-200 m above the crater rim. Seismicity remained low. The Alert Level remained at 3 (on a scale of 1-5). JMA reported that cloud cover mostly prevented visual observations of Ontakesan during 10-16 December; white plumes rose 50 m above the crater rim and drifted SW on 10 December. Seismicity remained low. The Alert Level remained at 3 (on a scale of 1-5). JMA reported that cloud cover mostly prevented visual observations of Ontakesan during 3-9 December; white plumes rose 100 m above the crater rim on 7 December. The Alert Level remained at 3 (on a scale of 1-5). JMA reported that cloud cover often prevented visual observations of Ontakesan during 12-18 November; white plumes rose 200 m above the crater rim and drifted E during 16-17 November. The Alert Level remained at 3 (on a scale of 1-5). JMA reported that cloud cover often prevented visual observations of Ontakesan during 5-11 November; white plumes rose 200-300 m above the crater rim and drifted NE, E, and SE. The Alert Level remained at 3 (on a scale of 1-5). JMA reported that cloud cover often prevented visual observations of Ontakesan during 29 October-4 November; white plumes rose 100-300 m above the crater rim and drifted NE and SE during 29-30 October and 4 November. The Alert Level remained at 3 (on a scale of 1-5). JMA reported that cloud cover often prevented visual observations of Ontakesan during 22-28 October; white plumes were periodically observed rising 100-300 m above the crater rim and drifting E and SE. Seismicity remained low. The Alert Level remained at 3 (on a scale of 1-5). JMA reported that cloud cover often prevented visual observations of Ontakesan during 15-21 October; white plumes rose 100-200 m above the crater rim and drifted NE and SE during 16-18 October. White plumes rose 600 m on 19 October. A news article from 17 October noted that the search for the seven people still missing from the 27 September eruption was stopped due to wintery conditions; the search was expected to resume in the springtime. The Alert Level remained at 3 (on a scale of 1-5). JMA reported that during 8-9 October ash emissions from Ontakesan continued. The plume turned white on 10 October, but during 10-14 October the emissions may have contained small amounts of ash. Tremor was below detection limits during 8-14 October. A news article from 12 October noted that the number of people killed in the 27 September eruption had reached 56; seven more were still missing. The Alert Level remained at 3 (on a scale of 1-5). JMA reported that ash emissions from Ontakesan likely continued during 1-7 October. The plume height could not be determined due to poor visibility although on 7 October observers noted that the plume rose 300 m above the crater rim and drifted E. Seismic levels fluctuated; tremor continued to be detected. A news article from 8 October noted that the number of people killed in the 27 September eruption had reached 55; nine were still missing. The Alert Level remained at 3 (on a scale of 1-5). According to the Japan Meteorological Agency, an unexpected phreatic eruption at Ontakesan occurred at 1152 on 27 September after an 11-minute period of tremor and uplift detected just minutes beforehand. The eruption produced a pyroclastic flow that traveled more than 3 km down the S flank and an ash plume that rose 7-10 km and drifted E. Ashfall was extensive in the area and up to 50 cm thick near the craters. The Alert Level was raised to 3. Earthquakes near the summit had temporarily increased during 10-11 September, and low-frequency signals were detected on 14 September. 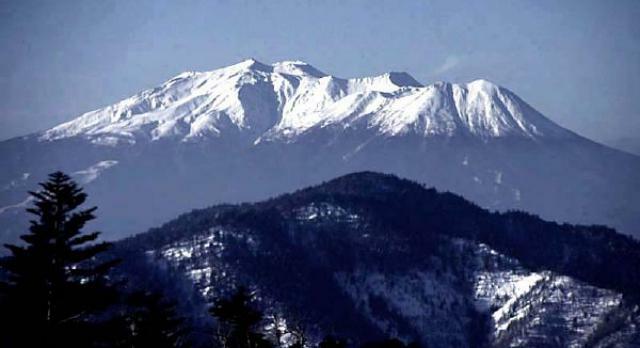 News articles on 1 October noted that 47 people had died, most of them found at the summit area while others were at a slightly lower elevation. Almost 70 more people were injured. Survivors described falling ash and boulders, and being in total darkness for several minutes as they made their way down the flanks. The volcano is popular to climb and nearly 300 people were hiking on the mountain that day. Seismicity fluctuated but remained elevated during 28 September-1 October. Ash-and-gas plumes rose 300-400 m above the craters and drifted E and SE. Tephra was ejected from several craters that [formed in a fissure about 300 m S of the summit (figure 1). There had been no fumaroles in the area]. . . . Figure 1. Map of On-Take, courtesy of JMA. The 500-m-long zone of 28 October 1979 vents is shown by a heavy NW-SE line immediately S of the summit. The four large craters trending NNE from the summit were formed during an eruption 14C dated at 23,000 BP. The short north-northeasterly line 1 km N of the summit represents a succession of small prehistoric explosion craters. The Kyodo radio network reported that officials were assessing damage caused by the eruption; damage was particularly heavy at Kaida, about [12 km NE of the summit (Kenga-mine)]. Some livestock had to be evacuated because of ashfall on pastureland. An earthquake swarm, including a magnitude [5.3 shallow] event, was recorded in the On-take area in October 1978. . . .
Information Contacts: T. Tiba, National Science Museum, Tokyo; Kyodo Radio, Tokyo; USGS/NEIS, Denver CO.
On-take's first eruption in historic time began suddenly before dawn on 28 October. No initial explosion was heard and no shock wave was recorded by JMA seismic stations, [but long-duration tremor was recorded from 0520 that may have been eruption tremor]. Ash emission continued through the day, intermittently during the morning but continuously during the afternoon, with strongest activity at about 1400. A dark ash cloud rose about 1 km (figure 2). About 1.5 m of ash fell near the summit and a few tens of centimeters fell on the flank. [A few millimeters] were deposited on [the villages of] Kaida-mura (12 km NE) and Mitake-mura (14 km SE), [the nearest inhabited areas] and slight ashfall covered a wide area as far as 150 km NE of the volcano (figure 3). No ejections of incandescent blocks were seen, but aerial observers reported that blocks were scattered around the vents (see below). Activity declined to white vapor emission before dawn on 29 October, although a slight ashfall occurred at a nearby village that morning. Steaming continued at varying intensity through mid-November. Figure 2. Eruption or vapor cloud height above the summit 28-October-16 November, courtesy of JMA. Figure 3. Sketch map of S Honshu and Shikoku Islands, Japan. Area of ashfall from On-take is shaded. Courtesy of JMA. During the eruption, numerous vents were active in a 500 m-long NW-SE-trending zone near the summit (figures 1 and 4). Along some portions of the zone, curtains of steam were visible from the air on 28 October. Kazuaki Nakamura reported that 10 small craters were seen during an aerial inspection on 3 November; four craters were emitting vapor. Takeshi Kobayashi, who has studied the volcano for 20 years, reported that no fumaroles existed prior to the eruption in the new vent zone. Figure 4. Zone of new vents on On-Take, sketched from the air on 3 November 1979 by Kazuaki Nakamura. Numerous vents that had existed along the fissure on 28 October were no longer visible at the time of this flight. The 28 October ash cloud was ejected by Vent 1, the largest of the vents at 30 m diameter. The other vents emitted mostly white steam during the eruption. No historical eruptions are known from On-take, one of Japan's larger stratovolcanoes. Kobayashi reports that the youngest 14C dates from On-take, 23,000 BP, are from scoria and lava flows composed of two-pyroxene andesite, ejected from at least five craters forming a NNE-SSW line on the N flank. Further References. Aoki, H., 1980, A compilation of reports on the volcanic activity and hazards of the 1979 eruption of On-take volcano: Special publication by the research group for the 1979 On-take eruption, no. B-54-3, 168 p.
Aramaki, S., and Ossaka, J., 1983, Eruption of On-takesan, October 28, 1979, in XVIII IUGG General Assembly, Hamburg, Report on volcano activities and studies in Japan for the period from 1979 to 1982, p. 1-7. Information Contacts: JMA, Tokyo; JMA also forwarded information fromT. Kobayashi (Toyama Univ. ); K. Nakamura, ERI, Univ. of Tokyo. In the 2 months since the 1-day eruption of 28 October, no ash ejection has been observed and vapor emission has declined. At the end of December, the vapor column was only 100 m high. About 10 local seismic events per day have been recorded since instruments were installed [on 29 October]. Epicenters have been distributed along a sharply defined narrow linear zone extending about 2 km N-S on the SE flank. Earthquakes had been felt in the area for about 2 years, but the number of felt events declined to about 1 per week after the eruption. Steam from the 28 October vents rose steadily to 100-200 m through January. No ashfalls have been observed in inhabited areas on the flanks since November, although snow in the summit area has been [slightly] darkened by ash and colored yellow by sulfur during this period. Muddy acidic water has been flowing from the 28 October vents since the eruption, killing fish in the Otaki River. The number of dead fish decreased in January. Local earthquake activity remained at November-December levels, about 10 recorded events per day. Steady vapor emission, to 100-300 m heights, continued through March. Vapor emerged from four of the numerous (at least 10) vents formed during the eruption in a linear, 500-m-long, NW-SE-trending zone near the summit. Airphoto data show that three of the four active vents have increased in size since the eruption. Ash in the vapor columns has repeatedly caused slight darkening of the snow in the summit area. Steady emission of a 100-300-m-high vapor column continued through early May. Ash had darkened snow in the summit area through March, but the snow melted in April. However, a pale dust cloud, presumably the source of the ash, continued to drift over the summit. Quiet emission of white vapor continued through June. The vapor rose several hundred meters above four summit-area vents. JMA personnel removed temporary seismic equipment installed 29 October and discontinued the visual monitoring begun on that date. Three earthquake swarms (20, 23, and 27 April) and four tremor episodes (27-28 April and 2 May) were recorded during late April-early May. The strongest swarm, on 20 April, lasted a few hours and included a M 1.6 event. None of the shocks were felt, and it was not possible to locate them accurately, but they were believed to be in the summit area. The 27 April tremor episode was the largest (table 1), and accompanying seismicity was the strongest registered (figure 5), since installation of the current seismometer, in July 1988. Table 1. Tremor episodes recorded at On-take, 15 July 1988-11 May 1991. Figure 5. Daily number of recorded earthquakes at On-take, 15 July 1988-5 May 1991. Courtesy of JMA. White steam emissions, unchanged from previous months (figure 6), rose 200 m from summit vents formed during a small phreatic eruption in October 1979. That eruption emitted ash for 1 day; steam emission declined, but has remained steady since then. Figure 6. Plume heights at On-take, 20 July 1988-13 May 1991. Courtesy of JMA. A M 6.8 earthquake, 12 km SE of the summit on 14 September 1984, triggered a landslide on the S slope of the volcano that killed 29 people. Aftershocks were distributed on the volcano's S flank in an elliptical zone that may mark a 20-km-long WSW-ENE fault (figure 7). Steam emission and surface activity were unchanged by the 1984 earthquake. Figure 7. Epicenter map of 138 earthquakes at On-take, January 1990-May 1991. Locations of the three swarms are not shown, but are considered to be in the summit area (triangle). The largest shock, M 1.8, was centered just W of the summit. The group of events in an E-W line 15 km S of the summit are aftershocks from a M 6.8 earthquake in 1984. Courtesy of JMA. Many earthquakes and tremor episodes have been detected by a seismometer near the volcano since April, bringing seismicity to its highest levels since the start of regular seismic monitoring in 1988. Earthquake swarms were recorded on 20, 23, and 27 April, and 12 and 13 May, with tremor on 27 and 28 April, and 2 and 12-16 May (figure 8). In mid-May, steam began to emerge from a vent formed in the last eruption (in 1979) that had remained quiet since soon after the eruption ended. Similar seismicity continued in June, and as of the 19th, 170 earthquakes and eight tremor episodes had been recorded. Figure 8. Daily number of earthquakes (top) and tremor episodes (bottom) at On-take, January-May, 1991. Seismicity has remained at high levels since April, with nine tremor episodes and 234 small earthquakes recorded in June (figure 9), down from 28 and 313, respectively, in May. Similar seismicity +continued as of 18 July. White steam plumes . . . rose to 200 m height. Figure 9. Daily number of earthquakes from the start of monitoring in July 1989 through June 1991. Seismicity decreased in July, with 94 earthquakes and two tremor episodes recorded . . . (figure 10). Summit vents continued emitting white steam plumes but these rose weakly to ~ 100 m . . . . Figure 10. Daily number of earthquakes January-15 August 1991. A swarm of 40 small, shallow earthquakes, centered beneath the summit, were recorded between 1600 and 2000 on 12 November by a seismometer 2 km SE of the summit (figure 11). No change was recorded in the emission of steam, which has steadily risen to several tens of meters, and no volcanic tremor was recorded. This was the first increase in summit seismic activity since May 1991 when seismicity was accompanied by increased steaming and perhaps by minor ash ejection (Kazan, 1991). Figure 11. Daily number of recorded earthquakes January 1990-December 1992. Reference. Volcanic Activity in Japan during April-June 1991, 1991: Kazan, v. 36, no. 3, p. 385. Small volcanic tremors were recorded in late August from a station 1.5 km SE of the summit. Information Contacts: Volcanological Division, Seismological and Volcanological Department, Japan Meteorological Agency (JMA), 1-3-4 Ote-machi, Chiyoda-ku, Tokyo 100 Japan. High seismicity was recorded on 6 July with a total of 29 earthquakes. Seismic activity at On-take has been ongoing in recent years. Data provided by the Japan Meteorological Agency indicates that from January 2000 through April 2003 an average of 140 volcanic earthquakes per month were recorded by the local seismic station. The number usually ranged between 90 and 200 each month. Activity was higher in July 2001 (300 total events, with 65 on the 1st) and December 2002 (206 total events, with 63 on the 4th). No volcanic tremor was registered. White plumes rising no higher than 300 m were observed once in June 2000 and March 2001, and more frequently during November 2001-January 2002. Small white plumes were seen once per month in September-November 2002 and January-March 2003. Information Contacts: Volcanological Division, Japan Meteorological Agency (JMA), 1-3-4 Ote-machi, Chiyoda-ku, Tokyo 100, Japan (URL: http://www.jma.go.jp/). The massive Ontakesan stratovolcano, the second highest volcano in Japan, lies at the southern end of the Northern Japan Alps. Ascending this volcano is one of the major objects of religious pilgrimage in central Japan. It is constructed within a largely buried 4 x 5 km caldera and occupies the southern end of the Norikura volcanic zone, which extends northward to Yakedake volcano. The older volcanic complex consisted of at least four major stratovolcanoes constructed from about 680,000 to about 420,000 years ago, after which Ontakesan was inactive for more than 300,000 years. The broad, elongated summit of the younger edifice is cut by a series of small explosion craters along a NNE-trending line. Several phreatic eruptions post-date the roughly 7300-year-old Akahoya tephra from Kikai caldera. 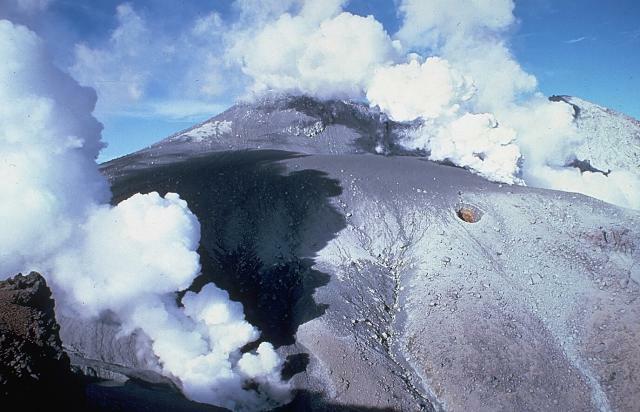 The first historical eruption took place in 1979 from fissures near the summit. A non-eruptive landslide in 1984 produced a debris avalanche and lahar that swept down valleys south and east of the volcano. Very minor phreatic activity caused a dusting of ash near the summit in 1991 and 2007. A significant phreatic explosion in September 2014, when a large number of hikers were at or near the summit, resulted in many fatalities. Matsumoto A, Kobayashi T, 1999. K-Ar ages of the Older Ontake volcanic products, Ontake volcano, Central Japan: reappraisal of the volcanic history based on radiometric data. Bull Volc Soc Japan (Kazan), 44: 1-12 (in Japanese with English abs). Remarks: Uplift of 3-6 mm near the earthquake swarm area of 2002-2004 is likely related to hydrothermal activity. Reference List: Kimata et al 2004. Kimata, F., Miyajima, R., Murase, M., Darwaman, D., Ito, T., Ohata, Y., Irwan, M., Takano, K., Ibrahim, F., Koyama, E. and Tsuji, H.,, 2004. Ground uplift detected by precise leveling in the Ontake earthquake swarm area, central Japan in 2002-2004. Earth, planets and space, 56(12), pp.e45-e48. The summit of On-take volcano provides a grand perspective of the Northern Japan Alps on the horizon. Norikura volcano, another massive Holocene stratovolcano, forms the broad massif in the middle distance. On-take is constructed within a largely buried 4 x 5 km caldera. Ichino-ike ("First Pond"), in the foreground, is one of a series of small explosion craters that cut the broad summit along a NNE-trending line. On-take's first historical eruption in 1979 followed a lengthy period of quiescence. The most prominent feature on the upper SE flank of On-take volcano is not a crater, but the headwall scarp of a volcanic landslide. The landslide occurred suddenly on September 14, 1984, in the absence of any eruptive activity. The resulting debris avalanche swept 13 km down the Nigori and O-taki river valleys. Vigorous steam plumes rise from vents along a fissure 300 m south of the summit on October 29, 1979, the day after the start of the first historical eruption from On-take volcano. During the first day of the eruption, ash and lapilli were ejected in an eruption column that reached 1.5 km above the vent. Strong vapor emission with periodic minor ashfall that dusted the summit region continued for several months. No fumaroles existed at this location prior to the eruption. Photo by T. Kobayashi, 1979 (courtesy Tokiko Tiba, National Science Museum). 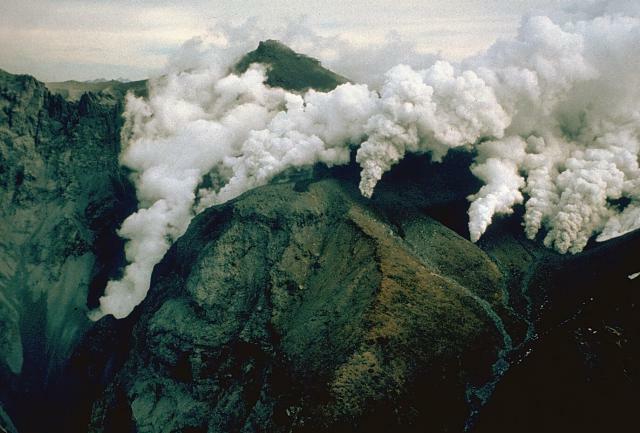 Vigorous steam plumes rise from craters near the summit of On-take volcano on November 9, 1979. The first historical eruption from On-take, in central Honshu, Japan, began on October 28 and produced ashfall to the NE from a 1.5-km-high eruption plume. Intense vapor emission (with minor ash that dusted the summit region) continued for several months. Massive On-take volcano is seen here from the NE with Kengamine, the summit peak, at the left-center. 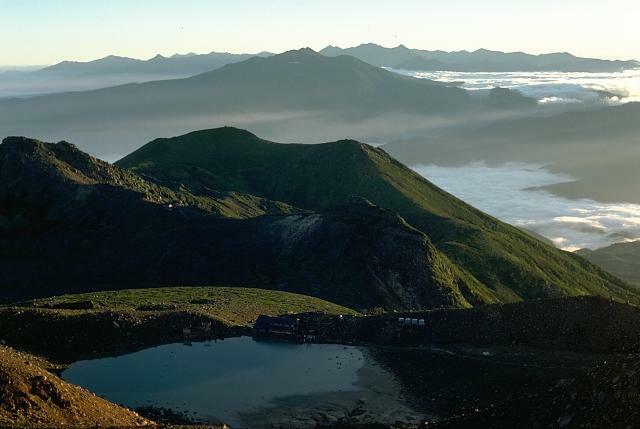 On-take is the second highest volcano in Japan and lies at the southern end of the Northern Japan Alps. The broad, elongated summit is cut by a series of small explosion craters along a NNE-trending line. On-take's first historical eruption in 1979 followed a lengthy period of quiescence. Ascent of the 3063-m-high On-take is one of the major objects of religious pilgrimage in central Japan. IRIS seismic stations/networks Incorporated Research Institutions for Seismology (IRIS) Data Services map showing the location of seismic stations from all available networks (permanent or temporary) within a radius of 0.18° (about 20 km at mid-latitudes) from the given location of Ontakesan. Users can customize a variety of filters and options in the left panel. Note that if there are no stations are known the map will default to show the entire world with a "No data matched request" error notice. Large Eruptions of Ontakesan Information about large Quaternary eruptions (VEI >= 4) is cataloged in the Large Magnitude Explosive Volcanic Eruptions (LaMEVE) database of the Volcano Global Risk Identification and Analysis Project (VOGRIPA).